• Select variable that you want to use (see Variables for description). • Click "Copy" (or double-click variable). Dialog will be closed. • Paste variable name from clipboard (Ctrl + V or Shift + Ins) to target setting's edit box. Note: this dialog suggests you only build-in special pseudo-variables (those with names started with "_") and commonly used variables. 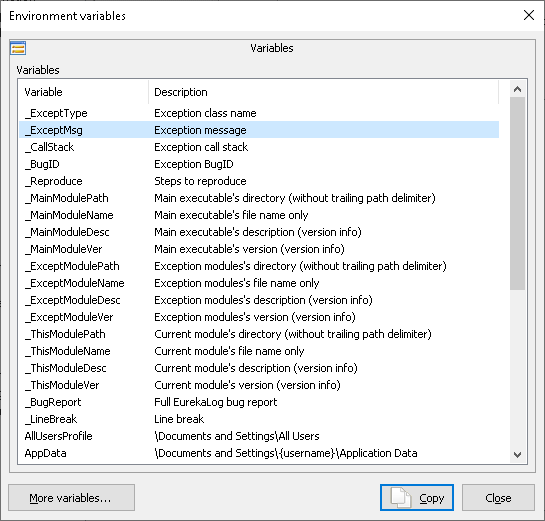 However, you can use any environment variable (even if it's not listed in this dialog). See also: environment variables.